he 1930s shaped the person I am today. The war news was especially frightening.However, my father's reassuring words and the way he looked into my eyes, right down to the scared part of my stomach, allowed me to feel safe and secure. We were in America and nothing bad will happen to us. I accepted his words and played like all the little girls in my neighborhood. Unafraid and happy. I did all the things little girls were expected to do. Claremont Park bound my neighborhood on one side, and busy 174th Street with all the little shops on the other. I played with paper dolls, which I always kept in a cigar box. My Grandpa supplied these boxes and I kept the dolls in one box and their clothes in another one. I also used one box as a bed so my dolls could sleep. My girlfriends would meet in the park and sit on the soft grass; the summer surrounding us like a comforter. We dressed our dolls and dreamed of growing up and wearing fancy clothes to parties. We exchanged the little paper dresses that we carefully cut out of the latest Shirley Temple Paper Doll Book. In front of our apartment houses trees provided shade and umbrellas of green leaves. Under these trees we played "A my name is Alice and my husband's name is Al, we come from Alabama and we sell Apples; B my name is Bertha and my husbands name is Bob, we come from Britain and we sell baskets" and on and on with our alphabet ditty. We used to jump rope and make up the sentences very rapidly; if we stumbled over a name we were out. This game worked just as well with a pink Spaulding ball bounced just at the right height so your leg crossed over it. I don't think we ever really got past "S my name is Sondra and my husband's name is Sam. We come from Sicily and we sell stringbeans." 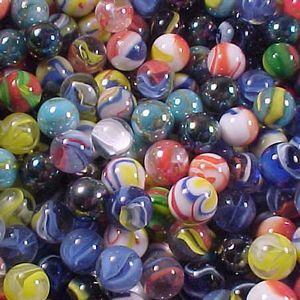 We would play jacks and count onesies and twosies and throw the tiny red rubber ball so you could nimbly catch the correct amount of jacks in your hand. The metal jacks quickly lost their shine and the ball developed many little gouges. Drawing a "Potsy" on the sidewalk with chalk was my favorite game. Skate keys were the objects of choice to throw so it landed on one of the chalked boxes. When the key landed on an unclaimed number, you put your initials in the corner of the box and no one else could step on your property. "Hey mister, can I have that cheese box?" "Whatch gonna do with it kid, play immies?" The cheese box was given to your father to cut out the little doors, four of them on one side of the box. My father was a cabinetmaker and my marble box was a thing of pride and a joy forever. The streets were tarred and usually very uneven, therefore finding the best spot was essential. You lined up your box exactly opposite from your opponent and played for hours. My middle finger would ache to flick a marble across the street and see it make the mark. At the end of the game upon occasion, someone had no immies left and the victor was pleased and proud of the round cold little spheres filling up the pants pockets. On Monroe Avenue in the beginning of the summer of 1939 I was the big time winner. There was no national anthem playing, but I knew I had won the gold. My marbles were very precious to me; each one an individual treasure, beautiful to the eye and heavy in the hand. There was an interesting side effect to my popularity. The big boys - thirteen or fourteen years old - sometimes smiled at me. My cousin Richard, four years my senior, once almost nodded in my direction. One of the neighborhood boys always smiled and waved his hand in greeting. He was very tall and skinny with reddish blond curls, and I fell in love with him. I don't know what happened to my marble collection or my paper dolls. There was not much room in our one-bedroom apartment for prized possessions and I guess as I got older my mother threw them away. I did manage to keep my skate key, in case I ever come across a hot game of "Potsy". My cousin Richard went overseas in 1943 and came home safely. We have been good friends for many years. As to that tall, skinny kid with the reddish blond curls, I married him.